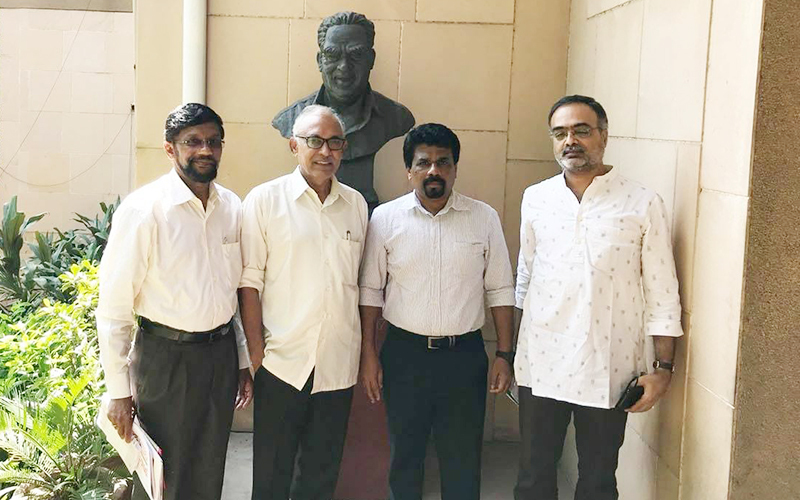 The Leader of the JVP Comrade Anura Dissanayaka visited India on an invitation from intellectuals in India to participate in a seminar that makes the intellectuals aware of the “People’s Administration to Develop & Protect Country” programme of the JVP. The seminar organized by Sri Lankans in New Delhi was held at Hotel Alpine Tree at Mahipalpur in New Delhi on the 30th from 2.30 p.m. to 6.30 p.m.
A large number of people including executive officials and technical officials serving in various garment industry sites in New Delhi, Bhikkhus from Mahabodhi Temple, Sri Lankan students in South Asia University in New Delhi and Comrade G. Devarajan from All India Forward Bloc (AIFB) were present. The participants have discussed with the JVP Leader the falsehoods and fabrications that are published by social media websites and the ’Facebook’ and regarding the future programmes of the JVP. During the visit, Comrade Anura Dissanayaka had a discussion with the Member of the Political Bureau of the Communist Party of India (Marxist) B.V. Raghavulu and the Member in charge of International Affairs R. Arun Kumar.